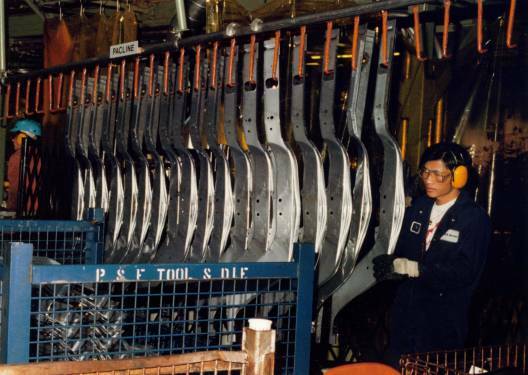 Irregular metal stampings, such as these under-body frame parts for the auto industry, are successfully handled and transported between welding operations by an overhead conveyor. Establishment of a buffer zone allows for accumulation and storage of parts. With the conveyor mounted overhead, little floor space is used and operator movement in the production area is not blocked. Safety, orderly handling and good visual inspection of parts are important added advantages. The conveyor chain travels within and is protected by a tubular track, which keeps the lubricant clean and free from abrasive atmospheric dust and other contaminants. Small radius curves for both horizontal and up and down travel are standard. Roller turns, traction wheels, or sprockets – common with I-beam type conveyors – are not necessary, providing an important safety feature. Conveyors can be powered for continuous or intermittent variable speed travel. The installation shown here at P&F Tool and Die in Concord, Ontario, carries automotive parts suspended by pendants on six-inch centers. It was supplied and installed by Pacline Corporation of Mississauga, who will be exhibiting their conveyor systems at The Industrial Production Show in Toronto from October 11th to 14th.